Is it weird when I end up listening to the soundtrack way, way more than I watch the show? Perhaps, but I’m kind of addicted to Matt Berry’s score for Snuff Box. Of course, this isn’t saying that the actual TV show is bad or, well, even anything less that awesome. It’s just that damned theme song. It’s so friggin’ CATCHY. I keep humming to myself “you thought it was gold/but it was bronze” OVER AND OVER AND OVER AND OVER again. Luckily, the US DVD collection of the complete series of Snuff Box comes with a CD of the music from the show. Or, I suppose, the CD of the soundtrack comes with a DVD of the series. Either way. But you’re more likely to find it in the DVD section, so let’s go with that. So, anyway. The show. 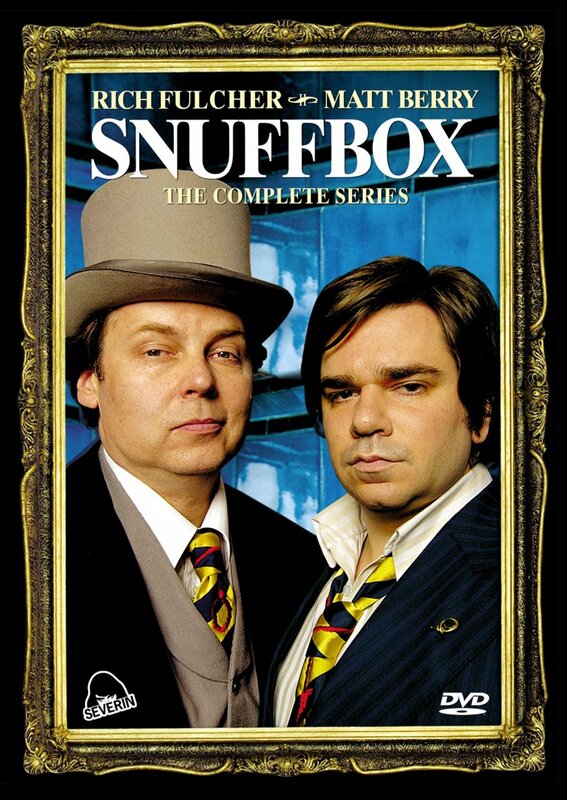 Snuff Box was a very short-lived program on BBC Three, featuring and written by Matt Berry and Rich Fulcher from The Mighty Boosh and Garth Marenghi’s Darkplace, to mention a couple. The series itself is basically a sketch show — because that was the only way the BBC would buy it. Berry and Fulcher wanted to do a narrative series, but the BBC demanded a sketch show… so they delivered a narrative show with sketches jammed through the middle. And, well, damned if it doesn’t work. In the narrative bits, Matt Berry is the High Execution to the King of England (… yes, king) — meaning he’s a hangman, and Rich Fulcher is his assistant. They spend most of their time in a gentleman’s club for hangmen, which also features a portal to 1888, where Rich visits with Matt’s great uncle Sir Charles. Matt and Rich have somewhat of an adversarial relationship with Matt robbing Rich blind, or Rich reading Matt’s diary aloud. As for the sketches, there’s a few recurring ones, one of Matt in various guises attempting to pick up women and reacting when they casually mentions a boyfriend, or of Matt and Rich as songwriters (also named Matt Berry and Rich Fulcher) who get into arguments with famous singers who come into their studio, Matt attempting to buy a pair of silver cowboy boots, or Rich being a good kisser. It’s pretty dark comedy — even the stuff I’ve mentioned that doesn’t sound like it would be dark is — but if you like that sort of thing, it’s pretty danged hilarious. Each of the episodes has at least one song — usually a few, including a new re-arrangement of the title theme, and well, as I mentioned above, the songs are all basically amazing. What’s particularly so? They’re all based off the same two chords, Dmin7 and G9. And yet, it doesn’t get old. Seriously. You thought it was gold, but it was bronze. DEVO In: Tired O Tourin'! I Want My Bike Back!